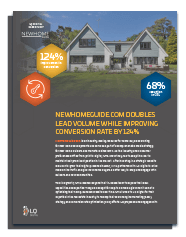 NewHomeGuide.com is an industry leading resource for home buyers searching for new home developments. As the industry and consumer preferences shifted from print to digital, NHG knew they had to adapt in order to maintain their prominent position in the market. After investing in a strategic website launch to grow their digital presence in 2017, we were selected by NHG as the digital marketing partner to optimize their acquisition strategy via SEM and CRO.